Its interface is a little dark for our taste, but you can’t fault the features: NDM is a great download manager and accelerator. The first thing you’ll notice about Ninja Download Manager is the way it looks: while many download managers go for the 'Windows XP with extra ugly ads' school of design, NDM looks more like Microsoft Edge. Its default look is very dark, but you can change that with the theme editor. 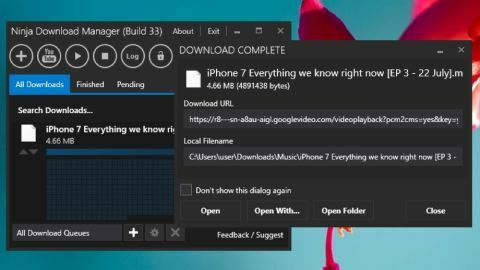 The reason apps like Ninja Download Manager exist is to tame giant downloads, some of which need to be completely restarted if something goes wrong mid-download. Ninja Download Manager prevents that from happening, enables you to pause and resume downloads whenever you like, and can manage multiple downloads of the same file from several sources to improve speed and reliability. You can schedule downloads, set download priorities and speed limits, and because files are downloaded sequentially – that is, from start to finish, unlike in torrents – you can preview media while it’s still downloading. It supports video of up to 1080p resolution, and it knows how to get the right file from popular video sites such as YouTube and Vimeo. There’s even a shredder to cover your tracks after files have been downloaded, but of course you won’t need that because these tools are for downloading content you have permission to download. So why shred? It’s a mystery. If you’ve ever wished that all apps looked like the Windows 10 Control Panel then have we got good news for you: Ninja Download Manager's interface couldn’t be any more Microsoft-y if it had Clippy from Microsoft Office performing the many dances of Steve Ballmer in it. It’s a little teenage for us but that’s personal preference. It’s otherwise clean and simple to navigate, and it’s easy to take advantage of features such as the built-in media converter and the speed limit option. Ninja Download Manager's automatic virus scanning is a really handy thing to have, although we’re sure you have that already. Don’t you? It’s a jungle out there.